Homespun Stitchworks..... For the love of vintage: Vintage fabrics and buttons ..... and caring for them. 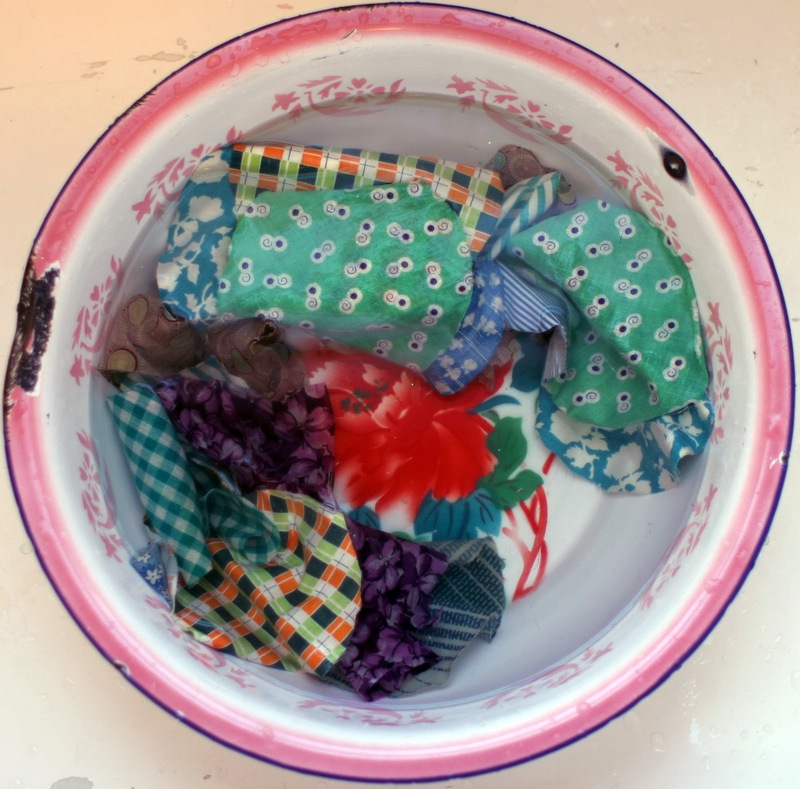 Vintage fabrics and buttons ..... and caring for them. But you have to take care of the fabrics and use them with care. I have an amazing fabric, it is stunning but very delicate so it would have to be used in a picture say, so that it is behind glass. I would not put any on a Christmas stocking for instance, it just would not stand up to continual handling. If you want to make a cushion cover out of vintage linen, then it has to be strong and the weave tight, or it will just unravel. You have to pick your fabrics carefully for each project that you do, not only the right colour for a project but carefully pick the project for the fabric. Most of the fabrics that I buy have already been washed and pressed, but if I need to I only hand wash the fabric. Firstly it is best to put warm water in your sink with delicate soap flakes and let the fabric soak for 15 minutes or so. Then gently wash the fabric and rinse it thoroughly. Hang it to dry and press when still a little damp, I have an old painted airer which was my husbands grandmothers I believe and it does the job wonderfully. When it is thoroughly aired you can wrap in non acid tissue paper and if you take the time to label what it is, then you do not have to keep disturbing them until needed. You can clean mother of pearl buttons too with mineral oil and rub dry with a cotton cloth. There is some dedicated and hard work involved in caring for vintage things but the results are worth it and they are then preserved for future generations to come. I find doing these things therapeutic and calming and when the work is done a great sense of achievement as well.